The club versus country debate has been raging in the world of sports for a while now. The latest, though, is self vs country. While nothing can match the high of winning a medal for the country at an international stage, there have been instances when players have chosen to go down the less popular route, and have put the club or self ahead of the country. The flight into Incheon is provided gaiety by Afghanistani cricketers, who had won a silver medal at the Asian Games four years ago. They've got profound love for Mahendra Singh Dhoni, and some jokes which, they say, indicate that Afghans and Punjabis aren't much different from each other — 'both act first think later', they say. After their rich medal haul at the Glasgow Commonwealth Games, the Indian weightlifters will approach the Asian Games with a renewed vigour. The Indians produced their best ever performance at the CWG, winning 12 medals (three gold, four silver and five bronze medals). Caving in to the sustained international pressure, the International Basketball Federation (FIBA) on Wednesday relaxed ban on turbans and other religious headgears on a trial basis in some competitions. The Indian women's team went down 0-10 to a superior South Korea in their second Group A match of the women's football competition in the Asian Games here on Wednesday. Asian Games organisers today kicked out an Iranian official for sexually harassing a female volunteer and issued strong warnings after two alleged cases in two days. The Olympic Council of Asia (OCA) banned football equipment manager Amereh Ahmad from Games sites and asked the Iranian team to send him home for verbally harassing the volunteer on Monday. Indonesia is poised to be selected as the host of the next Asian Games in 2018 after Vietnam withdrew because of financial concerns, the president of the Olympic Council of Asia (OCA) told Reuters on Wednesday. Kings XI Punjab will have to open their campaign against Hobart Hurricanes in the Champions League T20 without their strike bowler Mitchell Johnson. The Australian pacer has been ruled out for the first two games due to a rib injury. Punjab speedster Sandeep Sharma is the other casualty, due to a side sprain, that has taken the bite out of Kings’ attack in the opener on Thursday. On the batting front, Shaun Marsh too will not be there due to an elbow injury. Steven Gerrard was Liverpool’s hero with a stoppage-time penalty as the Reds marked their return to the Champions League with a win, while Arsenal endured a torrid evening against Borussia Dortmund. Forced to take the legal route after being denied the honour initially, boxer Manoj Kumar will be bestowed the Arjuna Award as the Sports Ministry has finally accepted his nomination. The Indian contingent finally had something to cheer about as young shooter Pradeep bagged a bronze medal after the seniors’ none-too-impressive showing in the 51st Shooting World Championships here. The Indian tennis players found themselves confronted with a similar dilemma ahead of the Asian Games — they were caught in a situation where they had to choose between their own interest and that of the country. They chose self-interest as Leander Paes, Rohan Bopanna and Somdev Devvarman decided to pull out of the Asian Games, citing the need to improve their rankings on the ATP Tour. As a result, India has been forced to field a second-string contingent. Sania Mirza, who too had pulled out initially, had a change of heart later and decided to represent the country. Men: Yuki Bhambri, Saketh Myneni, Divij Sharan, Sanam Singh. Women: Sania Mirza, Ankita Raina, Prarthana Thombare, Natasha Palha, Shweta Rana, Rishika Sunkara. September 24: Men’s Singles first round, Women’s Doubles first round, Women’s Team gold medal match, Men’s Team gold medal match, Mixed Doubles second round. (Somdev, Karan Rastogi, Sanam Singh and Vishnu Vardhan). Mixed Doubles: Silver (Vishnu Vardhan/Sania Mirza). Tennis wasn’t included in the Glasgow CWG. Men: Sukhen Dey (56kg), Sathish Sivalingam (77kg), K Ravi Kumar (77kg) and Vikas Thakur (85kg). Women: Khumukcham Sanjita Chanu (48kg), Saikhom Mirabai Chanu (48kg) and Punam Yadav (63kg). 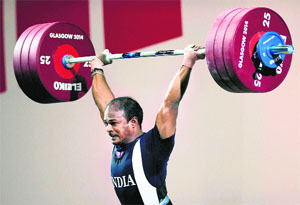 Indian weightlifters returned empty handed from the last Asiad. And on expected lines, it has sparked a vicious debate in the Indian sporting circles. Though nobody is questioning their commitment to the nation and their need to protect the ATP points, it still needs to be pointed out that a premier multi-sport spectacle like the Asian Games comes in every four year, while the ATP Tour events are part of the annual international calendar. Had it been the Olympic Games, it's unlikely that the players would have put their professional tour commitments ahead of representing the national. AITA said the association allowed the players to play in the important ATP and WTA tournaments so that they can have a respectable opportunity to represent India in the World Championships. The question is, isn't the Asian Games equally ‘important’ and ‘respectable’ for the country's athletes. With three of its biggest stars missing from the action, India’s chances have taken a big hit. This pullout becomes all the more important as Indian tennis is a force to reckon with in Asia and the first-choice contingent was almost certain to win a few medals. In the last Asian Games, India had won five medals. Also, the last-minute pullout meant that there was no time to name the replacements in the men's team. So instead of the original 12-member team, India will field a nine-member team. In the last edition of the Games, Somdev had won the men's singles and doubles gold, but he wouldn't be there this time to defend his titles. Paes and Bopanna, too, will be missed. 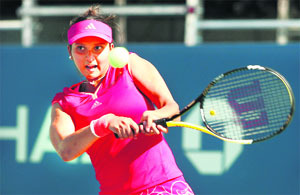 In the absence of top male stars, Sania will have to inspire a relatively young side to fight it out. While it's a tough challenge for the younger players, it's an opportunity, too, for them to prove themselves at such a big stage. Sania, who has six medals, including one gold and three silvers from the Games, could be paired with either Divij Sharan or Saket Myneni in the mixed doubles. Others in the women's section include Ankita Raina (world ranking 293), Prarthana Thombare (337), Natasha Palha (509), Rishika Sunkara (594) and Shweta Rana (617). The men's team comprises Yuki Bhambri (world ranking 153), Sanam Singh (358), Saketh Myneni (430) and Divij Sharan (doubles ranking 124). Interestingly, Yuki, who will be leading India's men's singles challenge in the absence of Somdev, lost both his matches in the Davis Cup World Group playoff against Serbia, and he would find the rivals from Japan, South Korea and Uzbekistan even tougher to handle. As for men’s doubles event, Yuki will pair up with Divij Sharan, while the second combination will have Saketh Myneni and Sanam Singh. The challenge for the men's team is immense as India are not seeded among the top four teams. Japan, Chinese Taipei, South Korea and Uzbekistan are the seeded teams, and India will have to play one of these four sides to be in contention for at least a bronze medal. Seven gold medals will be up for grabs in tennis competitions to be held from September 20-30 at the Sipjeong Stadium. However, we're informed that Koreans themselves aren't much fond of smiling. “Koreans don't smile much,” says Hyeim Park, a sales executive returning home from a vacation in Europe. As if to illustrate this, she motions to indicate tears falling from her eyes, mourning that she's had only a week's holiday. But this verdict turns out to be overly pessimistic: The Korean populace, especially the ones welcoming the Asian Games guests, turn out to be very willing and frequent smilers. They've also got springy backs and bow repeatedly out of politeness and respect, each time they thank you or address you or hand back your accreditation card or passport. Passage into Incheon isn't speedy, and the queues seem to crawl a few inches every 15 minutes, but it's not bereft of smiles. They've also got a rather surprising welcome for the Indians — it makes you rub your eyes and wonder if you read right — in English letters, they've got a sign that says 'Incheon Maan Swagath Ho'. The Indian hockey teams have felt extremely welcomed. The wealthier is delightful, with temperatures below 30 C and just a hint of nip in the air in the evenings, and the two teams have had good practice, they say. “The weather is good and we have acclimatised to the conditions here,” says midfielder Navjot Kaur. The economic weather is good, too. Incheon, the twin of the capital Seoul, is reaping the fruits of rapid commercialisation over the last 11 years. It became South Korea's first free economic zone in 2003, and now presents an awe-inspiring, glittering skyline. It seems trillions of tons of concrete have been poured every square metre. Incheon means 'Kind River', and the river of opportunities seems to have benefitted Koreans much. In contrast, South Korea's estranged sibling, North Korea, lives in rather deprived conditions. The two siblings, existing on the extreme side of the economic philosophy, are sworn enemies now. The flights between the two countries are rare, but now they've been put in operation to bring in over 150 athletes down from the North. There's a ban on carrying the North Korean flag in South Korea, as a government spokesperson reminded his countrymen today. Yet, South Korea still has got a Reunification Ministry — the hope of joining another country is quite in contrast with the hope of another people halfway around the world, the Scottish who are set to vote to become independent of the United Kingdom. Sport and politics are inextricably linked — as the Commonwealth Games in Scotland became a vehicle for nationalistic sentiment, so have the Asian Games become a symbol of hope for some Koreans, a symbol of division for other. After their rich medal haul at the Glasgow Commonwealth Games, the Indian weightlifters will approach the Asian Games with a renewed vigour. The Indians produced their best ever performance at the CWG, winning 12 medals (three gold, four silver and five bronze medals). But replicating that feat at the Asian Games, where the field includes Olympic champions, will need the Indians to perform out of their skins. India, which didn’t win a single medal in last edition, has not won a gold medal in weightlifting at the Asian Games till now. And to win it this year, India will have to outdo countries such as China, Kazakhstan, Iran and North Korea — the top four medal winners at the 2012 London Olympics. The Indian Weightlifting Federation is aware of the tough competition is not bursting with optimism. If lifters K Ravi Kumar and Sathish Sivalingam replicate their CWG form, they might be in contention for a medal. A 10-member team was pruned to seven by the Sports Ministry. Sukhen Dey (56kg), Sathish Sivalingam (77kg), K Ravi Kumar (77kg) and Vikas Thakur (85kg), who bagged medals at CWG, made the cut for the Asian Games. In the women’s contingent, Khumukcham Sanjita Chanu and Saikhom Mirabai Chanu (both 48kg) have a decent chance of winning a medal if they come up with their best performances. Admitting that winning a medal at the Asiad is much tougher than winning at CWG, Indian Weightlifting Federation vice-president Sahdev Yadav said, “We are keeping our fingers crossed, hoping to clinch a medal, especially considering the fact that the players did not get any time to rest after the Commonwealth Games. It certainly affects their performance. Playing two major competitions back-to-back in less than two months is never easy. We are just hoping that the lifters continue their winning spree.” Sahdev expressed delight at the fact that all weightlifters who won medals at the Commonwealth Games have cleared their dope tests. “We have been working really hard to make weightlifting dope free in India. Apart from their practical training, our coaches and other experts are continuously working on making them aware of the banned substances that may land them in trouble and I am glad that their efforts have been suitably rewarded. India has earned back its pride, and to ensure that it continues, we are regularly doing tests and thorough medical check-ups of all India campers,” he added. FIBA has changed the rule for a two-year testing period before making it permanent across all formats of the game. The development means the players will be allowed to wear hijabs and patkas during competitions while playing professionally. The previous FIBA rules allowed players to wear a 5-centimeter headband to control hair and sweat. That drew objections that it was discriminatory against Muslim and Sikh players, who wear head coverings for religious reasons. Two Sikh players from Punjab -- Amritpal Singh and Amjyot Singh -- were asked to remove their turbans minutes before India were to take on Japan on July 12 at Fiba Asia Cup in Wuhan in China. The players, who have always played in turbans, were told that they were in violation of one of FIBA’s official rules, which states, “Players shall not wear equipment (objects) that may cause injury to other players”. “We welcome this rule change by FIBA because it allows Sikhs and Muslims to wear their religious head coverings in international competitions. It’s the victory of all faiths,” Tarlochan Singh, senior vice-president of the IOA, told The Tribune. “FIBA will evaluate the rule again in 2015 and a full review will be done in 2016 before making a permanent rule change. 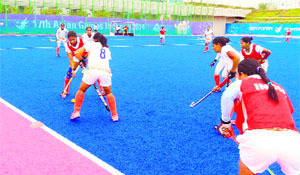 The international body will allow players to wear head coverings in its 3-on-3 competitions which is a welcome development,” Tarlochan informed. Basketball Federation of India welcomed the decision, calling it a step in right direction. However, at Incheon, the the new rulings won’t come into play. Korea led five-nil at the interval. Four goals from Yoo Younga, a hattrick from Jeon Gaeul, a brace from Jung Seoblin and one from Park Heeyoung saw the Asian heavyweights brush aside their Indian counterparts. The match was a totally one-sided affair as Korea dominated the proceedings right from the kick-off, so much so that they surged into a 2-0 lead by the ninth minute itself. Thereafter, there was a barrage of attacks on the Indian defence. Asian Games organisers today kicked out an Iranian official for sexually harassing a female volunteer and issued strong warnings after two alleged cases in two days. The Olympic Council of Asia (OCA) banned football equipment manager Amereh Ahmad from Games sites and asked the Iranian team to send him home for verbally harassing the volunteer on Monday. Also on Wednesday, police were investigating a Palestinian footballer who was accused of groping a female worker in an athletes' village laundry room the day before. The player was banned from leaving the country. The incidents prompted the organising committee to put up signs in Games accommodation warning against harassment, while the OCA said it had "zero tolerance" for such cases. "It was not a matter of a physical attack; it was verbal sexual harassment," OCA director general Husain Al-Musallam said in a statement, referring to the Iranian official. "The OCA will not tolerate any misbehaviour of this nature and we will take a tough stance. We cannot accept this, so we have removed him from the Games." The Incheon Games Organising Committee put up strongly worded posters warning that harassment cases would be prosecuted under South Korean law. "Sexual violence is a serious crime that impoverishes the victim's mind and mentality," said the notices seen in official Games accommodation. New Delhi: Delhi police has intensified investigation in the alleged sexual harassment of a woman player by an international-level gymnast and a gymnastics coach. The two accused, who are part of the squad which left for the Incheon Asian Games yesterday, have been booked for allegedly passing obscene comments and making vulgar gestures at the woman player, police said today. Asked if the accused will be asked to return to India, the officer said that will be done if needed. The decision will be formally ratified at an OCA General Assembly in South Korea on Saturday but OCA President Sheikh Ahmad Al-Fahad Al-Sabah told Reuters that there was an agreement in place to give the multi-sports event to Jakarta. Sheikh Ahmad acknowledged that Hanoi's pullout had posed problems the OCA had never faced before, but they had not been left in the lurch for long. In Johnson’s absence, either Lakshmipathy Balaji or Thisara Perera is likely to take the role of the strike bowler. Hobart Hurricanes, a Tasmania-based team, is being led by Tim Paine and is hoping to strike rich in the tournament on the strength of their IPL players. Interestingly, Kings XI Punjab’s skipper George Bailey is a key member of the Hurricanes but has chosen to play for the Kings. Dimitri Mascarenhas is another player who has represented Kings XI Punjab in earlier editions. Hurricanes coach Damien Wright said, “It is our first time here as a team, to be in the championship like this is wonderful for everybody. We have got some very experienced players. It’s always nice to come to big tournaments with experienced players. 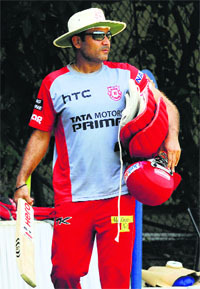 We have got lot of guys who have played IPL, have played for Australia,” he said. Hyderabad: Andre Russell smashed a breathtaking half century while Ryan ten Doeschate struck a fine unbeaten 51 to guide IPL champions Kolkata Knight Riders to a three-wicket win over Chennai Super Kings in a Group A match of the CLT20 here today. Chasing 158 to win, KKR were in trouble after slumping to 51 for five inside 10 overs. But Russell (58 off 25) and Ten Doeschate shared match-winning 80 runs for the sixth wicket off just 42 balls to lead KKR to victory. Brief Scores: CSK: 157/4 (Dhoni 35*, Bravo 288; Chawla 2/26); KKR: 159/7 in 18.6 ovs (Russell 58, Doeschate 51*; Nehra 4/21). Gerrard struck from the spot right at the death to hand Liverpool a 2-1 win in their Group B opener against an awkward Ludogorets Razgrad at Anfield yesterday. Meanwhile, goals just either side of half-time by Ciro Immobile and Pierre-Emerick Aubameyang gave 2013 runners-up Dortmund a 2-0 win against Arsenal in Germany in Group D, and the hosts were unlucky not to win by more. Holders Real Madrid chased away some of their early-season blues when Gareth Bale scored the pick of the goals as the record 10-times winners routed FC Basel 5-1 in their Group B opener. After a deflected Nacho effort put Real 1-0 ahead in the 14th minute, Bale raced on to a Luka Modric pass and dinked the ball brilliantly over onrushing Basel goalkeeper Tomas Vaclik before volleying into an empty net. Manoj, a 2010 CWG gold-medallist, said that he was informed of the Ministry’s decision this morning. The controversial recommendation of boxer Jai Bhagwan for the Arjuna Awards had led to Manoj approaching the Sports Ministry officials, who, he said, had assured him that his name would be added to a list of 15 athletes in a review meeting. But after being snubbed for a second time in the review meeting, Manoj took the legal route and filed a case in the Delhi High Court.